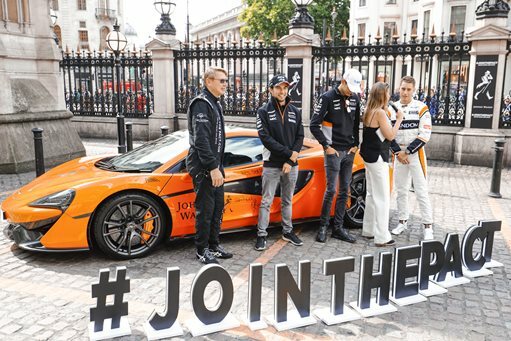 Ahead of the British Grand Prix, where Lewis Hamilton won for a record-equaling fifth time, CSM helped Johnnie Walker launch a ground breaking anti drink drive campaign Join the Pact in central London, aiming to collect 250,000 commitments over the Silverstone race weekend. The activity, which CSM Brands, Content and Live teams delivered, kicked-off in Charing Cross with two-time World Drivers Champion and Johnnie Walker Responsible Drinking Ambassador Mika Häkkinen, McLaren Honda Driver Stoffel Vandoorne and Force India Drivers Sergio Perez and Esteban Ocon, coming together for a Facebook Live. A McLaren 570s was installed at Charing Cross and on display throughout the day, collecting signatures from consumers as they came into the area for the F1 London Live event. Later in the day Mika Häkkinen signaled the start of the drivers’ parade as part of the F1 event, taking Sergio Perez for a trip down Whitehall in the Johnnie Walker two-seater Join the Pact car, a Caparo T1. The event attracted a whole host of F1 drivers, past and present, and provided a showcase not only for the sport but for the important anti drink drive message. The campaign continued throughout the weekend in Silverstone, with the McLaren 570s and Caparo installed in the F1 fan zone for consumers to sign. As part of the campaign Johnnie Walker has partnered with the Department for Transport THINK! campaign which was visible on both McLaren Honda F1 cars on the weekend.